Our father among the saints Gregory I, also known as Gregory the Great, was the Pope of Rome from September 3, 590, until his death on March 12, 604. He is noted for his writings. Also, the Liturgy of the Presanctified Gifts has been attributed to him. St. Gregory's family had large land holdings in Italy, which St. Gregory sold to help the poor following his father's death. After turning his home into a monastery named for St. Andrew, Pope Pelagius II appointed him as an ambassador to Constantinople; however, Gregory disliked the worldly atmosphere of the court and never learned Greek. After his consecration as Bishop of Rome on September 3, 590, he negotiated a peace with the Lombards, who besieged Rome, and he dispatched St. Augustine of Canterbury to evangelize Britain. He is known in the East as Gregory the Dialogist for his four-volume Dialogues, in which he wrote of the lives and miracles of the saints of Italy and of the afterlife. It is the primary source of the lives of St. Benedict of Nursia and his sister Scholastica. His other writings include the Moralia on Job, a commentary on the Book of Job; his Homilies on Ezekiel; the Pastoral Rule, which served as the prime manual for priests in the West for many years; and a great number of other sermons. He added the commemoration of the Apostle Andrew to the embolism on the Lord's Prayer in the ancient Roman Mass; as a result, the Roman Mass is often called the Mass of St. Gregory, especially among a number of Orthodox. He was a patron of ancient Western chant, often called "Gregorian chant" for his patronage. In the East, the Liturgy of the Presanctified Gifts celebrated during Lent commemorates St. Gregory as its author, although it is unclear what role he played in its development. 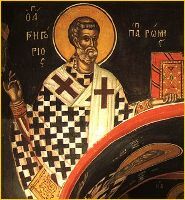 St. Gregory reposed on March 12, 604. "For to despise the present age, not to love transitory things, unreservedly to stretch out the mind in humility to God and our neighbor, to preserve patience against offered insults and, with patience guarded, to repel the pain of malice from the heart, to give one's property to the poor, not to covet that of others, to esteem the friend in God, on God's account to love even those who are hostile, to mourn at the affliction of a neighbor, not to exult in the death of one who is an enemy, this is the new creature whom the Master of the nations seeks with watchful eye amid the other disciples, saying: 'If, then, any be in Christ a new creature, the old things are passed away. Behold all things are made new' (2 Cor. 5:17)." "We truly love God and keep His commandments if we restrain ourselves from our pleasures. For he who still abandons himself to unlawful desires certainly does not love God, since he contradicts Him in his own intentions.... Therefore, he loves God truly, whose mind is not conquered by consent to evil delight. For the more one takes pleasure in lower things, the more he is separated from heavenly love." You willed to walk in the path of the Gospel, O most blessed one. Therefore you have received from Christ the reward of your labors! Entreat him that he may save our souls! Guiding the orders of monks to the fold of heaven. From there you taught the flock of Christ His commandments! Now you rejoice and dance with them in the mansions of heaven! This page was last edited on October 22, 2012, at 19:25. This page has been accessed 66,083 times.